Landing a job has 3 steps. The most common questions asked at interviews or the most common things which a prospective employer notices in cover letters and resumes are good analytical skills of the individual. No matter which sector you want to work for, be it a corporate sector, educational sector or a creative sector, all have problems and require individuals with excellent analytical thinking skills. By definition of analytical skills we mean the ability to discover, gather information, understand, take decisions and lastly solve problems which are of a complex nature. 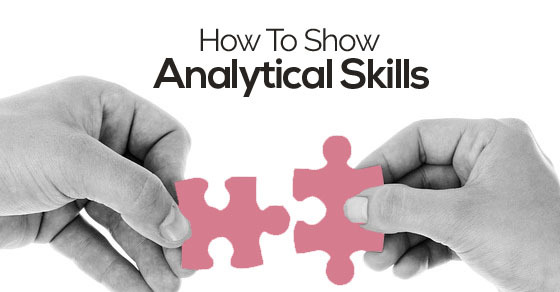 So, showcasing analytical skills is an important factor for increasing your chances of employment. Let us now see how you can show your analytical skills. A cover letter is sometimes more vital than the resume as it is that piece of document which contains a detailed description of your skills and abilities. It is sent along with your resume. In this letter you are supposed to tell your future employer why you are the most desirable for the job. Sometimes, people who possess strong analytical skills fall short to express them properly. Creativity has taken over this generation therefore only writing ‘I have good analytical skills’ will get you nowhere. Do not repeat all that you have written in your resume. It is unnecessary. Instead, get straight to the point and start by highlighting your skills. Every company is not the same and does not have the same problems. Some may face problems with analyzing huge amounts of statistical data; some may want individuals who can lower their loss percentages by analyzing the market structure and needs. While others might have a problem analyzing essays and the like. Be specific about the type of analytics skills that you possess. A cover letter is just a short expansion of the CV. Here you just highlight the most important skills, as being analytical is most important. Do not write stories or no one is going to read it. There are thousands of people applying for that one job. Make two paragraphs at the most and dedicate one whole paragraph for analytical skills. Even if you are describing a story, keep it short. As mentioned, you need to research thoroughly about the company before you write your cover letter. See if the organization faced a setback or a loss recently or if one of their campaigns failed. Use it as an example and highlight ways in which you can solve that problem for them. This will let your employer know that you are genuinely interested in the company’s welfare. After the cover letter, the next big thing is your CV or your resume. The resume will have most of the information and can be much bigger than the cover letter. Therefore, it is here that you need to write about your success stories as a good analyst. Let us now see how you can play up your CV to showcase your analytical skills. A CV should convince the employer that you truly have the necessary analytical problem-solving skills. Therefore, it is important to be specific about the kind of analytical problems which you can solve. You should totally avoid using superlatives like very, exceptional, extremely and like to stress on the intensity of your skill. Instead, be direct and expand your explanation to show the intensity. This piece of advice is underrated but is the most important. Oftentimes to land a job successfully employees tend to over exaggerate and give vague examples of previous problem-solving. Remember, there is a reason why they are employers and you are an employee. They are experts and can see through everything. Therefore, it is important to mention only those instances of problem-solving which you have truly faced previously. Before you highlight an instance or a story where you successfully came out of a problem, make sure that it actually works. Think a lot before writing because employers will surely tell you that your solution may not work for this and this reason. You need to be prepared to answer those analytical interview questions positively showing how your solution is the ideal one for the given problem. Testing for analytic skills by employers generally includes putting a series of events in a proper sequence, critically analyzing essays or looking for loopholes in advertisements. Interviews testing your analytical skills are also known as behavioral interviews. In such interviews, you can expect to be asked about your past analytical experience and instances where you successfully identified and solved a problem. You need to keep these things in mind before you appear for interviews. Do not think about acting in the spur of the moment. It is impossible to build up a proper analytical problem-solving success story on the spot. You will surely forget to add relevant details. Therefore it is advisable to prepare 3 to 4 different types of problem-solving success stories beforehand. Be it your own problem solving success story of the past or a problem given by them to be solved by you, if the employers find you thinking too much while describing your example story, they will not believe it wholeheartedly or if you take too much time to solve the problem given by them, they may assume you are not that good at it. Therefore, think on your feet and always be prompt. Even if you are thinking, do not show it. Interviews mean explaining. Every interviewer is going to ask you to explain your past experiences at problem-solving. There are many approaches of presenting a good explanation for your example by preparing it step by step. One of them is the IDEAL approach. This is similar to the IDEAL approach. The Star approach makes the construction of your story faster with less of unnecessary details. Just remember the necessary information under every head in bullet forms. While a problem is a problem big or small, it is important to highlight the major ones that you have solved earlier and to which the employers are able to relate to. For example, do not talk about your habit of being a non-punctual individual and how you overcame it. This shows you in bad light. Always showcase your convincing or persuading powers, as a good analyzer should also have great communication skills and be able to convince or persuade easily. This shows that you will be able to easily sort out conflicts between members of your workplace as well as conflicts with clients. They want a problem solver not a problem maker. While you may possess exceptional analytical skills, if you are the one creating the problems (though you obviously solve it) your powers will be overlooked. Always mention problems that came up due to a group failure or which came up naturally due to certain wrong decisions but not because of you. You need to be the hero who solved it and not the villain who caused it. Be prepared to be cross questioned. Your solution or even solutions which have worked and given positive results may not be accepted by the employers and they may ask how in some other way too you could have solved it. It is just that they are testing your logical thinking skills and to see how you react on being rejected. Another very important way in which you can show your analytical skills in an interview is by showing ways in which, you are a good decision maker. A problem to be solved needs some instant decisions. You need to be able to take decisions fast in order to solve problems fast. Therefore, decision-making abilities will be an added advantage for you if you wish to come across as a good analyzer. How would you know whether you have good analytical skills? Before you boast about your analytical skills or know ways to showcase it in your cover letters, CV’s or in interviews, you need to be sure if you truly are a good analyzer or a problem solver. Read through these basic qualities of a person who has good analytical skills. A creative bent of analytical mind helps you solve problems in the shortest and easiest way possible and also brings up several alternative ways to solve the problem. A good problem solver does not give up. He/she is always persistent and consistent with his analytical work towards solving the problems. If one fails he searches for other ways to solve it. Persistence is the key. You are responsible and confident enough to challenge traditional ways of doing things and working towards discovering new and improved ways of solving age old problems. A person possessing exceptional analytical skills has an enquiring and an innovative mind. Being curious and enquiring about everything helps to identify problems faster and innovation helps to solve it easier. A good analyzer does not wait to be ordered to solve a problem. He identifies the problem, takes an initiative and informs others and solves it. How to Improve Your Analytical Skills? Now if you feel you do not have all these qualities, do not worry as there are ways in which you can improve analytical skills. Here are some ways in which you can become a better analyzer. You need to train your brain to reason logically. There are many online sites that provide you with free online analytical challenges. You can also purchase several logical reasoning books and practice analytical questions. Games such as chess, Sudoku, bridge and crosswords are proven to greatly enhance analytical skills. Certain computer games which involve strategic planning, statistical and critical analytical analysis skills and examining the advantages and disadvantages and determining consequences also help. Most employees find seminars boring and do miss the chance of not attending it if it is not compulsory. Professional workplaces conduct seminars and even provide training for improving analytical skills. Attend them and you are sure to benefit from them in the future, as analytical skills help you throughout your life. Why Employers Value Analytical Skills? Employers at the time of selecting candidates for their organization always try to hire the best among others. To get selected, the candidate not only needs to be good at his work, but there are also other skills which most employers look for. They can be behavioral skills, analytical skills etc. As per the definition analytical skills are the ones which help the employee to analyze, understand the issue and then take proper decisions to solve it. Such skills help the organization’s overall growth and progress. They also do not cause any hindrances in their success path, as all the actions taken would be tried, tested and effectual. To better one’s analytical skills, the candidate should be able to think creatively. His creative thinking skills would help to analyze the pin trends causing the problem, which others may not find. This skills also help them to bring effective solutions to the problems faced by the organization. The role of the critical thinking skills helps in making the right decisions based on the information gathered by the employees. The solutions need to be good enough to solve the problems. Data analysis is an important skill which every employee possessing analytical skills needs. This skill helps in analyzing large sums of data and finding patterns out of it. You not only have to analyze but read and understand the data to make the most out of it. Research is one of the most important type of analytical skill. After the data collection and gathering is done, proper research about the topic need to be done to develop the right solution for the problem or issue the organization is facing. An employer selects employees for his/her organization only when he is satisfied with the individual’s overall personality as well as professional development. Analytical ability is the one skill through which all other skills improve automatically. It is crucial for everyone. Therefore, now that you know the ways to showcase it in every way and also the ways in which it can be improved, practice as much as you can and be confident about your abilities.